Paul Kennedy grew up on Pilgrims Way in Wembley between 1950 and 1962. In 2015 he wrote Where I lived when I was a Kid, a moving poem about his prefab childhood. He kindly agreed to share it with the Prefab Museum and all our readers. Here it is, followed by bits of information about the Pilgrims Way Estate. In the colder months the paraffin man would call and out you’d go with your cans, he always seemed to spill some and you’d smell it on your hands. but how lucky was I to have grown up in such a place, the delightful Pilgrims Way. 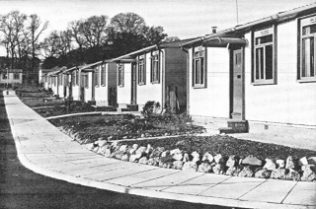 So after twelve happy years in our aluminium prefab we had to make a move, to Wembley in a three bedroomed brick house, which had a tiled roof. 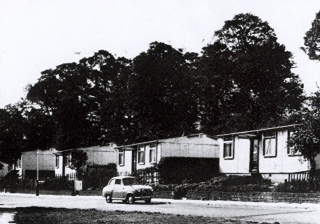 Our prefabs were the B2 Aluminium prefab, sometimes referred to as an AIROH. As far as I know, all 114 prefabs at Pilgrims Way were first let between January and July 1948. 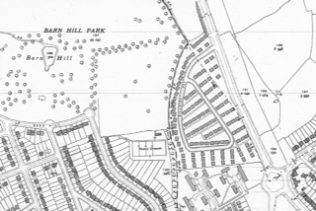 Pilgrims Way was built on what was Barnhill green belt land, this picture is of the lower end of the estate, in the 70s they were all demolished and the whole area returned to what is now dense woodland. This photo was taken during the demolition of the estate in the 70’s (I think it was in the 70’s!) 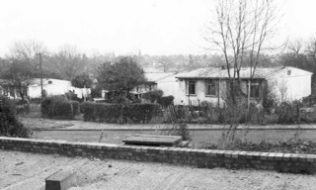 you can see one of the blocks that the prefab would have been sitting on also the brickwork too, the steps you can see lead down from the front door to the footpath below, this was at the top of the estate and would have been one of the prefabs in the earlier photo with the little Austin car parked out front in the road. 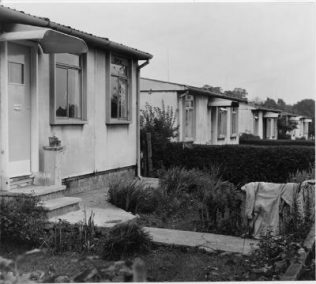 It’s the rear of the prefabs you can see and their back gardens. Though ours was a Nissen Hut in Homerton, London, E – and we couldn’t afford a wireless let alone a television. Your writing brought back many wonderful memories of the amazing childhoods we had at Pilgrims way a unique place to live. My thanks to you Paul beautifully written. Wonderful stuff Paul and Doug!